A scalpel blade is an irreplaceable tool for healthcare professionals like surgeons, doctors, nurses and vets to perform procedures and surgery. Despite its high usage amongst the healthcare workers, not everyone knows the best practices in removing scalpel blades. You would most likely come across one of these 3 methods commonly used by healthcare workers to remove blades: by hands, by forceps or needle holders, or by using a two-handed scalpel blade remover. However, all of these practices involve using two hands, and I can assure you that there is nothing safe about removing scalpel blades with two hands. In this blog post, we discuss why these 3 methods are probably the most dangerous way to remove a scalpel blade. 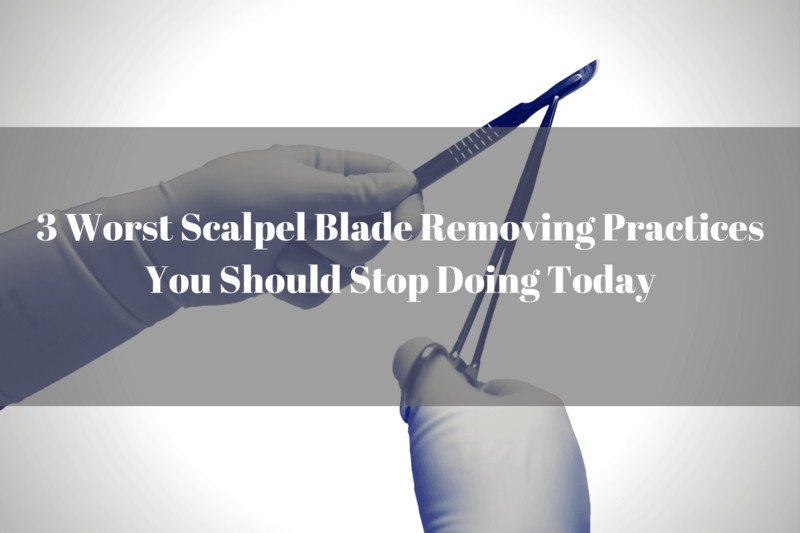 This is the oldest way, and by far the most dangerous way of removing used scalpel blades. Although nurses and doctors may be wearing gloves when performing surgery and procedure, there is an immediate risk of the blade may pierces or cut through the skin if the scalpel blade is not handled carefully. This is the most popular way of removing scalpel blades because a pair of forceps or needle holders give nurses and doctors the perception that they have some form of protection between the scalpel blade and their hands or fingers. However, the scalpel blade can be wet and bloody from procedure, which makes it difficult for a pair of forceps to grip onto the blade’s surface. The forceps can slip and scalpel blades can flick off, and cause a laceration to your hand or fingers. Another common answer is by using a scalpel blade remover, which is becoming more popular in the healthcare industry recently. Using a scalpel blade remover is definitely safer than by using hands or forceps. However, a lot of the traditional scalpel blade removers in the market require the users to remove the blades by performing a re-sheathing or recapping action. For example, a nurse will need to insert the scalpel blade into the remover held in their hand. There are needle counters in the market today incorporated some form of blade remover mechanism. Similarly, they require two–handed action where one hand needs to support the needle holder, and the other remove the blade. I am sure you can predict the danger in performing these actions: blade can miss the entry point into the remover and accidentally cut your hand. Despite regulations and directives in place in in multiple countries (check out our blog post on Summary: Sharps Injury Regulation in the US, UK and Australia) to protect healthcare professionals from blood borne exposure, nurses and doctors are sometimes complacent about the way they prefer to remove scalpel blades. Fuentes and his colleagues1 examined the 137 scalpel injuries reported by the staff of a 550-bed tertiary hospital between 1987 and 2003, and found that 13% of injuries happened during a blade removal process. The percentage might be even higher due to some unreported cases. Save yourself from becoming the next victim when removing scalpel blades. Fuentes, H., Collier, J., Sinnott, M., & Whitby, M. (2008). “Scalpel safety”: Modeling the effectiveness of different safety devices’ ability to reduce scalpel blade injuries. International Journal of Risk & Safety in Medicine, 20(1-2), 83-89.